"What scriptures/some school/my favorite philosophy/acharyas/XYZ say about [some concept]?" Many a times these Qns are on-topic, but many a time the Qns are off-topic (IMO). The header merely acts as a "boarding pass" to insert the Qn. Now since, it's asking about scriptures, one can't close it as off-topic or opinion based. Question: In what scenario, we should close-vote such Qns when above "boarding pass" is present? Should I travel abroad for studies? What does Hinduism say about travelling in foreign regions for Shiksha & Diksha? Between this question- "Should I travel abroad for studies?" and - "What does Hinduism (or Hindu scriptures) say about traveling to foreign lands for the purpose of studying?" --- there isn't any major difference. When we ask on Hinduism.SE.. parts in the beginning of a question like - "What's the view of Hinduism" or "What do Hindu scriptures say" ... are often understood and so adding them specifically is not of much significance.. So, just by adding those kind of lines in the questions, one can not make his/her "off-topic" question on-topic.. There's one more issue here..
You say "my off-topic query" ..Now how are you so sure that your query is really off-topic? Suppose a user A has gone through 1% of the scriptures.. Now a question that is off-topic for A may not be so for a user B who has gone through 2% of the scriptures .. He will say wait it's not off-topic..i know where this topic has been discussed.. and so on .. Therefore only a person who has gone through all the scriptures can decide whether a particular question is really off-topic or not.. leaving a few very obvious cases of course..
Lastly, this issue can not be dealt with generally, we need to deal with individual questions .. and i think users here are smart enough to close questions as off-topic which are genuinely so ... although some errors can creep in given the nature of the site and the vastness of Hindu scriptures. Is it ok for a student to sleep during the daytime? Now, it will obviously fetch some close votes to start with.. but this is not off-topic .. the scriptures provide an answer to this query. Is it ok as per Hinduism OR Is it ok as per Hindu scriptures for a student to sleep during the daytime? So, this particular question will not be closed as off-topic because it is genuinely not and irrespective of whether or not it has at it's start, lines that are mentioned above..
Also, as already said, it will be good, if you can add to your post, which questions, according to you, remained open just because they are being asked in the particular aforementioned way, and, if they were not been asked in that fashion, would have been closed as off-topic ..
We had a plenty of discussion already here and the votes to this question and several examples show how this can be misused. To make the mood lighter, let's have a funny story (Sorry for a long answer). There was a boy studying in a middle school. He was preparing for an elocution competition conducted by his school management. He learned thoroughly about Cow and reached his school. Finally the hour came and the competitions started. After some time, it was his turn. He talked about it clearly. As follows. The teachers were impressed with this essay. Gave good marks. As a second topic, they asked about "Sky". This made the boy startled. He only prepared for Cow essay. He had no idea about Sky. He thought for a minute and started talking about Sky. So, he continued with Cow essay. His teachers did not give marks for his second essay. Why? Because he was talking about another topic to bring relation between two different topics. I believe why I said this story now. We are not in a different situation. We received many questions like having "According to Hindu scriptures,", "What to scriptures say about ", "According to Hinduism"... This line has been the entry pass to bypass the off-topic check. It is turning to a Boat programming meme. Boat programming means a question posted on Stack Overflow which asked what is needed to program on a boat. The reason why it was asked was having the word "Programmers" in the question. It was eventually deleted by Jeff Atwood. Here the word is Hindu scriptures and any question can be made on-topic for the site using them. Some may ask for examples. I have plenty of them. There was a question about origin of Dravidian languages. To those who don't know, questions regarding Indian languages are off-topic for our site (Not only Indian, any language. No bias). So, I pointed out that such questions are off-topic. After a comment, the OP realized that and self deleted that question. After a month or two, the same user has posted the same question. No change in the topic. It asked the origin of Dravidian languages. But this time, there was modification... yes there is a "What do Hindu scriptures say about origin of Dravidian languages". Voila, that was upvoted. I voted to close it and repeated almost the same comment. The reply was "What do Hindu Scriptures say". That comment was upvoted heavily and the reviews were favorable. There were not enough close votes on the question. It was answered too. If we look at both of the questions, there is nothing different. The gist is the same. If there is no phrase 'Hindu scriptures say' in the first question but the question is same. We are a site about Hinduism. 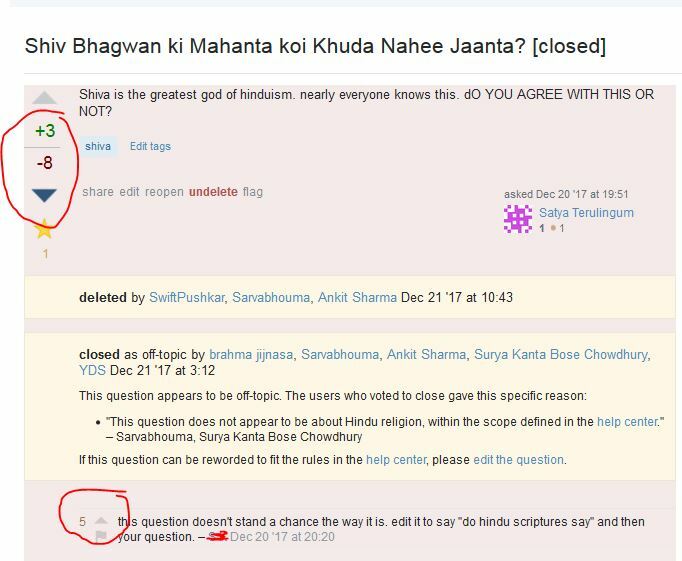 Answers posted here are obviously from Hinduism point of view only (That is why the tag hindus was blacklisted). So, even if there is no mention of "Hinduism" or "scriptures" in the question, the answers will be the same. I do not see any difference between two variations. That will be the same. It will be off-topic only. There is another type of modifying a question. We know that dream questions and personal advice questions are off-topic for our site. There was a question posted about asking how to interpret dead relatives in a dream and had details of that specific dream. That was closed as off-topic (with a mod intervention. I tried to reopen after editing but it failed). That was fine. After an year or two, there was another question asking the same i.e., But there is a modification in the question. The OP added a paragraph where dreams are discussed in Hinduism and gave an introductory passage of importance of dreams in Hinduism. (OP has some knowledge of Hinduism and a high rep user) The question is not closed as off-topic. That is open (reviewers chose to leave it open. Mod intervened again). If we remove that passage and look at the topic, that is asking about dream interpretation only. There are some questions which were made on-topic in this way. Irony is The question is not changed but there was a passage explaining their role in Hinduism. I don't think that makes a difference. Let us see how. For example, I have a question about horse riding. Horse riding is a skill and one of the 64 sciences. This was taught to people in ancient India. Lord Krishna and Balarama learnt these skills in 64 days. Horse riding played a major role in Mahabharata war. Horses also have an importance in Hinduism. Lord Surya turned to a horse and beget Ashvini devatas. Nakula was a master in taming horses. So, my question is According to Hindu scriptures, how to master horse riding? How to tame horses? Is there a text explaining this (which was taught in the ancient times)? So, is this a question about Hinduism and on-topic for us? If we remove that paragraph, that is definitely off-topic. The gist is learning about horse taming which is not a religious question. So, this should make clear. Same question if asked without that passage, that would be closed immediately. But the above question will be opened. That would also give place to bias based on reputation. The question not given importance but the word like Hindu scriptures is given importance. People who are not well versed with those topics have more probability of getting closed. So, there will be a bias which is a dangerous situation to handle. This trend of making blatantly off-topic questions into on-topic by adding "Hindu scriptures" is a dangerous. Unfortunately, this is mostly done by users with access to moderator tools (names not required). That would definitely add a bad name to the site's reputation. There can be many variations like this. There can be 'n' number of questions about non Hinduism topics added with scriptural reference. It has reached to a state where users started advising to add the line to stay away from review queues. Shiv Bhagvan ki mahanta koi Khuda nahi janta. Nearly everyone knows this. Like if you agree. I don't know if the user said without knowing the help center and scope. But see the upvotes question and comment got! this raises question on the guidance we are giving to new users. Need to take care. These are types of statements on social media which say "Like and RT if you agree." That too written in Non-English. Such questions are clearly off-topic for Stack Exchange. I have even received comments that it will be a valid question if "What do Hindu scriptures say" is added. It supports my statement that closeable and off-topic questions (like personal advice, scientific speculation, hypothetical) are converted into on-topic by adding that statement. So, the question arises, why is it off-topic to ask a matter which is present in Hinduism books? This is a valid question. But there is a huge disadvantage if everything present in Hindu texts is allowed. Hindu texts and sages talk about a wide range of topics almost everything. There is a mention of gravity, speed of light, rainbows, music, pets, cooking, public speaking, language, pleasing women (!) and so on. In the Brahma purana, there are chapters dedicated to water cycle. In the Brahmanda Purana, birth of animals is discussed. In the Narada Purana, there are chapters discussing music, mathematics. There are varied texts on different topics. By using some lines and sentences, we can easily bring relation between Hinduism and any non religious topic. IN other words we can manipulate. If we encourage questions based on the mention in the texts, then there is nothing off-topic for our site. The off-topic section from the help center can just be deleted. It is because Hindu texts talk about each and everything. So, going by that logic, we should allow questions about music, dance, mathematics, physics, chemistry, Cooking and all. We will turn into a site which accepts almost everything. So, that would make us a site of everything. This would only increase questions per day but those are not good questions as it also defeats the purpose of Stack Exchange to have a different sites to deal with different topics. It doesn't take much time to fill the site's questions with non religious questions with scriptural references. That would decrease quality. We should not to forget to Focus on quality. So, the solution we have is to allow questions which asks for scriptural reference of some belief or a practice (we do that and many questions are present already) and not references of some Non religious topics like environment, physics, cooking, dice etc., If a question is posted about "Scriptural reference about ". This 'X topic' should be a religious topic and not a scientific or other. If a question is asking scriptural reference about , then the question itself is about that topic. If there is a better site which answers better, we can also migrate. "What scriptures/XYZ say about ... " -- should not be the free way to convert an off-topic Qn to on-topic. The main concern is how to filter such posts? One simple way to determine such hidden off-topic post is, to read the Qn without the above header. And decide if the Qn is suitable. Another better but effortful way is that the active users may edit/remove such header line out of the Qn, as our site anyways requires the answers to be backed up with sources. Let me introduce myself, and explain why I'm here, first. I'm Tinkeringbell and I moderate both Interpersonal Skills and Meta.SE. I've been discussing this problem/post with one of your moderators in a moderator chatroom, and after reading the answers here, I decided to try and help by writing one of my own, to bring to your attention another approach to this problem. What does the Bible say the age of the earth is? What's the Biblical basis for a seven day creation and a 6,000-10,000 year old earth? The bottom line is that "What does the Bible say about X" is often a matter of personal interpretation, or opinion. For many answers that claim "The Bible says X", it is probably fair to expect that you can take some other verse (perhaps out of context) and say "No, the Bibles says Y or Z." From my discussion with your moderator, I got the impression that the same can be said for Hindu texts. Asking 'What does X say about Y' is probably not the type of question you'd want. Is “What scriptures/XYZ say about …< my off-topic query >?”, a free way to convert a Qn to on-topic? I would say it's not, and it never should be. Take the example of Christianity, and don't accept questions that simply ask 'What does scripture say about X?'. Even the Bible has mentions of people sleeping, of people farming, of people hunting... yet questions that ask 'What does the Bible say about sleeping' aren't useful for Christianity SE, as sleeping isn't a 'religious practice' within Christianity. Instead, focus on questions where scripture can be used as a source to explain Hinduism, its beliefs and its practices. This will make your site less prone to being too vulnerable to interpretations and discussions (primarily opinion based), unanswerable questions/questions where the answer is a simple 'there is no scripture on this' and even trolling (really, who doesn't want to know what scripture says about pineapple on pizza and settle the debate forever/turn it into a religious war?). If you can edit a question to ask 'What text is at the base of this belief/practice', by all means, go for it. But just rephrasing a question to ask 'what does the text say about < something unrelated to Hinduism as a religion >' should be off-topic and bad practice. Scriptures are oxygen to Hinduism. There are lot of scriptures for Hinduism, which covers wide variety of topics. The topics covered by Hinduism in detail are assets of Hinduism. If the question asked by OP has its answer in Hindu scriptures, then it should be answered. Here many users raise the issue that how many such topics can be allowed to ask. Let us be clear here. Hindu scriptures does not contain any entire subject (say mathematics, geography, horse riding, cooking etc.,). SUB (a subject Physics) is a subject by itself and may have a separate site in stack network. But the SUB covered in Hindu scriptures is an asset or property of Hinduism. So, the questions that target to the SUB inside scriptures should be on topic. If we do not allow such questions by saying that there are other sites to discuss about them, then the issue is that the other sites of SUB discuss about contemporary SUB, not Hindu SUB (SUB explained in scriptures). If we have answer for question in scriptures, then there is no reason to make it off topic. Thus, if any question start with scriptural opinion or scriptural reference, we have to treat them as questions on Hinduism only, not as questions that fall outside Hinduism. Bottom line is that Hinduism did not explain total mathematics in its scriptures and hence allow the questions for mathematics inside scriptures. Not the answer you're looking for? Browse other questions tagged discussion scope asking-questions close-reasons vote-to-close . Personal advice questions whose answers are present in scriptures? Why Hinduism SE doesn't have “not Constructive” and “not a real question” options for closing questions?